Every person learns differently. These Learning Styles are the VAK - Visual Learner, Auditory Learner and Kinesthetic Learner. We can learn predominantly in one style or we can learn best with a combination of learning styles. Some of us have special learning needs - ADD, ADHD, Dyslexia, etc. - that require more support for successful learning. Have you ever noticed that some students seem to learn differently from other students? How sometimes an approach that works with one student will not work at all with another student? When introducing a concept, do you have some students who need to see and read it first before they get the picture, some who need to hear it to clearly understand it and still others who need to play it or be “hands on” in order to figure it out? That is because there are 3 different Learning Styles: Visual, Auditory and Kinesthetic. A Visual Learner is often quite artistic and enjoys creative hobbies. Visual Learners seem to learn best when information is presented in writing or by using pictures and diagrams. When learning a new concept, Visual Learners often like to see instructions written down or write them down themselves. Use different coloured highlighters consistently. For example, use one colour to highlight key words, another to highlight key instructions and another one to highlight example boxes. These colours will connect theory content visually for the students. 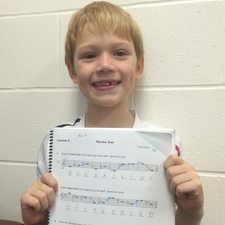 For some Visual Learners, using colours to highlight the direction of pitch will connect the direction on the theory page to the direction that they play on the piano. I like to use blue for "up" (the blue sky is up high); green for "down" (the green grass is down on the ground); and red for "same". When they see it on the page, they need to clap, tap and/or play it! 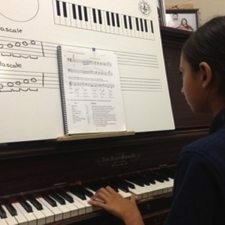 This will strengthen their Auditory and Kinesthetic connection to the visual content. A Visual Learner will love using the Whiteboard to reinforce concepts (and for playing games!). Colored dry-erase markers make concepts pop! And, if you make a boo-boo, it is so easy to fix! Pentascales appeal to all learning styles. The Visual Learner benefits from understanding the pattern of the Pentascale as they see it in their music. 1) See the Pentascale Pattern of the melody. The Visual Learner likes to SEE the pattern. 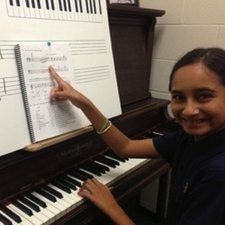 Using her Prep 1 Rudiments Workbook on Page 119, Sonya discovered that the melody in #7 was based on the C Major Pentascale. She pointed out that the final note was simply the Tonic of the C Major Pentascale written one octave higher. She decided that she would also play the melody in the G Major Pentascale, and that the final note would then be the Tonic of the G Major Pentascale written an octave higher (the note G). 2) Write the Pentascale Pattern of the melody. Use the Teacher Whiteboard to write out the Pentascale Pattern. Have the student choose a Pentascale to transpose into and write that Pentascale Pattern on the Whiteboard. Explore how the patterns are the same, but the sound is going to be different. Be creative and have fun exploring high and low sounds on the keyboard. 3) Play and Transpose the melody. Choose another Pentascale Position to transpose the melody into and play the melody in the new Pentascale Position. 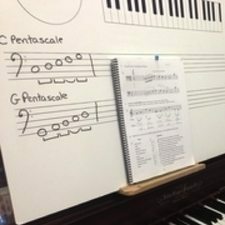 When your Visual Learner sees the pattern of the Pentascale, they will be able to use the pattern to play Pentascales on different notes. They will then be able to transpose their music into different Pentascales. Have fun exploring what you played. What was different between the two performances? Did the sounds (the tonality) change or did the pitch change? Did you transpose higher or lower? 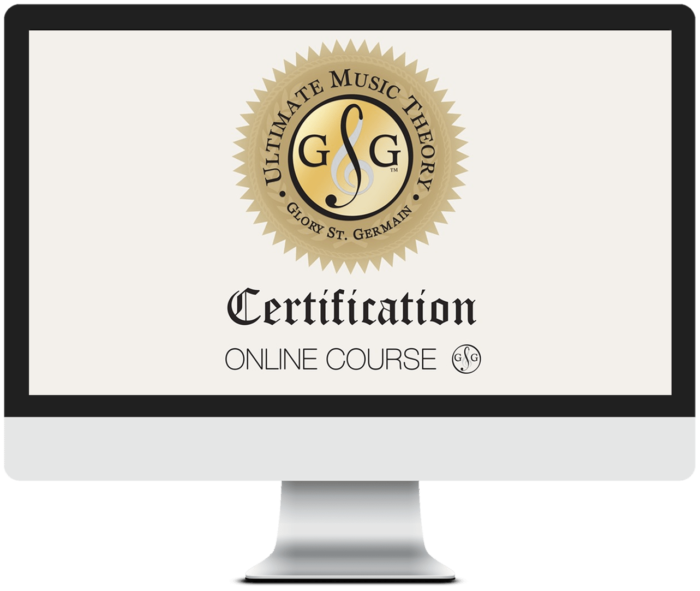 This is an online course that you learn when YOU want to learn. You get lifetime access to all the Teaching Videos. There is no deadline for each lesson. And you will learn how to teach theory to students of all Learning Styles! Check it out!